I’ve had this stripey, spalted Zebra Wood Tenor Ukulele set sitting in the wood stacks for a long time. I was re-organizing my wood stocks and decided that it was time to put it to good use. I also am a sucker for spalted wood of any kind and the pattern of the spalt in this wood added good visual interest. 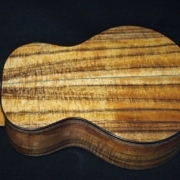 I’ve made probably six zebra wood tenor ukulele using this wood and have not been disappointed. 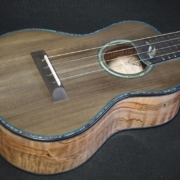 Some of the instruments used conventional tops of spruce or cedar but on this build I decided to use all the remaining stock for top, back and sides. The wood density compares with Koa and Myrtle woods so I found that the response and tonal qualities similar but tending to mimic Mahogany. Zebra Wood is, however, a bit more porous than either Koa, Myrtle or Mahogany Macrophilia. 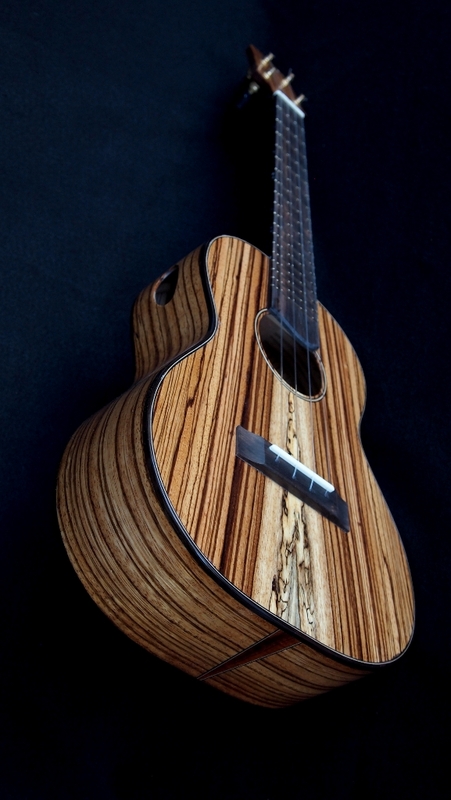 I’ve seen quite a few “laminate” instruments made from this wood but very few custom instruments. If you have a craving to know more about Zebra Wood, go to Woods of the World Database. The neck is a dark, solid Sapele (carbon fiber “passive” truss rod, of course), and the finger board and bridge are Munn Ebony. 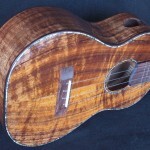 The accent wood is Hawaiian Koa. 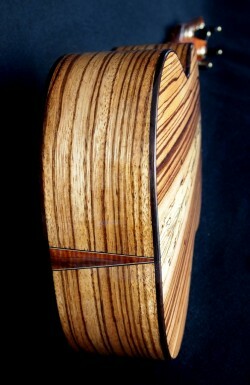 The binding is India Rosewood with black/white maple purfling. This is a solid wood instrument. It may not be traditional, but personally, I think it is good management to use laminates in acoustic instrument construction where possible. If well managed, laminates can produce extremely attractive, good sounding, and very strong acoustic instruments. I remember my 25 year old brand X “car” guitar was predominately constructed of laminates–I think I dropped the big bucks at $165. I must have carried that instrument around for at least 12 years in the car without a case and in every weather condition imaginable. Not only did it not self destructed but it sounded great. It has now found a new home with a friend who is continuing the tradition. More and more I am seeing acoustic builders experiment with different construction techniques using laminates of wood and aerospace materials. 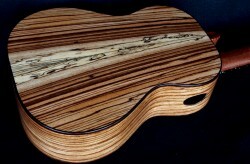 If you have a moment check out some of the innovations at Ryan Guitars. I think you will be impressed!